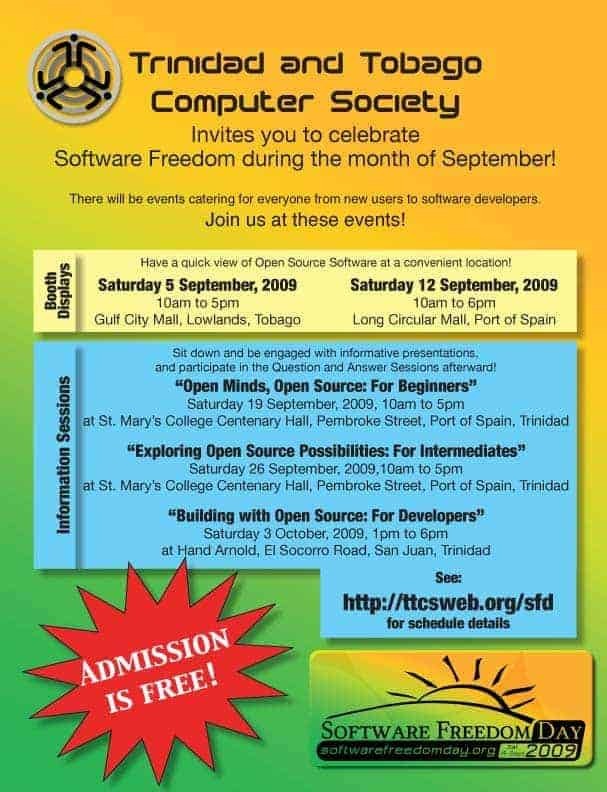 The Trinidad and Tobago Computer Society (TTCS) celebrated Software Freedom Day (SFD) 2009 with a series of activities in September, including scheduled presentations with giveaways and demonstrations of various aspects of Free and Open Source Software. Admission was FREE and CDs/DVDs of Free and Open Source Software were give to all attendees. The activities involved outreach meetings involving booth displays at malls in Trinidad and Tobago as well as information sessions geared towards beginners, intermediates and software developers. Promotional material was generated for the events including a number of flyers and a press release. Newspaper ads (2″ x 8″) were also done for the three daily newspapers. One table geared towards providing information about the TTCS and filling out membership forms online. Members of the TTCS were able to distribute approximately 140 Ubuntu Cds, 140 OSSWin Cds, 250 Flyers and added 120 new members to our mailing list (see photos and videos section below). There was a good turnout ; we had 50 TTCS OSSWIN CDs & 50 Ubuntu CDs and towards the end, we had to burn 10 additional CDs and 5 additional Ubuntu CDs to give out. 220 flyers were given out and it was estimated that up to 200 patrons visited the TTCS booth at Gulf City, Lowlands Mall. At Long Circular Mall, distributed about 140 Ubuntu CDs, 140 TTCS OSSWin CDs and 250 Flyers. Recorded on Carnival Saturday, see https://www.ttcs.tt/2016/09/16/ttcs-podcasts-1-to-20-from-2005-to-2010 for shownotes and recordings. ideas for TTCS arising from the recently concluded ICANN Mexico meeting. Held at Handarnold, we tried the Wii Balance Board along with the Wii Fit game for the Nintendo Wii. The Wii Balance board is a peripheral device shaped like a household scale that measures a user’s weight and balance to interact with games. planning session for Software Freedom Day 2009, planning for upcoming meeting on Windows 7, activities of TTCS within ICANN and discussion of other TTCS activities. Software Freedom Day 2009 planning. Government to create ICT company? Held at ENCO, we looked at the release candidate (RC) of Microsoft Windows 7 by installing Windows 7 RC on at least two machines. the “Boosting ICT in the Dominican Republic” event on June 4th-5th which the TTCS attended. Online meeting to finalise plans and the text for the letters for Software Freedom Day 2009. The TTCS had its first Tobago event with a booth at the Gulf City Lowlands Mall, Tobago about Software Freedom on Saturday September 5th, 2009 from 10am to 5pm. that up to 200 patrons visited the TTCS booth at Gulf City, Lowlands Mall. SFD booth at Long Circular Mall, Trinidad. Distributed about 140 Ubuntu CDs, 140 TTCS OSSWin CDs and 250 Flyers. SFD Information Session on “Open Minds, Open Source: For Beginners” at St Mary’s College, Port of Spain. Did an analysis of our recently concluded Software Freedom Day meetings for 2009, and ideas/planning for future non-SFD TTCS activities. TTCS recently attended in a meeting on Tuesday, December 8 to learn more about Microsoft’s latest operating system, Windows 7 (http://tech.groups.yahoo.com/group/ttcs/message/24708). Once the room was filled, about 5:30 P.M., the meeting commenced. The audience, which numbered roughly fifteen persons, ranged from TTCS veterans to a few new faces. We were welcomed by the affable Pradeep Raman, General Manager of Microsoft Trinidad, who introduced himself and shared a bit about his background. He then introduced the evening’s presenter, the confident and articulate Microsoft Technology Specialist, Jonathan Jagai. The presentation, “What’s New In Windows 7”, was moderately technical, and covered several new features of Microsoft latest operating system. Jonathan initially gave a broad overview of new Windows 7 features, then went into more depth with each feature. The slides showed the customer feedback upon which new features were designed and implemented. A brief explanation of the underlying technology was given. Where possible, the feature was demonstrated in Windows 7. Several new features of the Aero interface were also demonstrated, including the Aero Peek, Aero Snap and Aero Shake, among others. Aero’s eye candy was rivaled only by the PowerPoint 2010 graphics. Far from being XP with an Aero interface, Windows 7 was designed from the ground up with security, usability and stability in mind. After the hour-long presentation was concluded, a number of questions were fielded and answered thoughtfully by the presenter. Refreshments were provided afterwards and the evening’s gathering concluded around eight o’clock. The current mechanism for censorship of material is unwieldy and impractical in the contemporary setting. In the interest of encouraging personal choice of the consumer, the Government proposes to introduce a rating classification system which will guide the content of the motion picture and video entertainment product. Accordingly the framework should be focused on content regulation and/or management in the interest of protecting the citizenry (and especially minors) from unwanted or unexpected exposure to harmful, distasteful or socially malignant content. Such regulation shall include all forms of motion picture (film, videocassette, DVD, etc.) and/or video entertainment products (commercials, electronic games etc. ), and auxiliary materials associated with the marketing and release of such products. Where there are gaps in the overall legislative framework, or where it is necessary to provide clarity for applicability herein, the framework shall defer to parent frameworks associated with the maintenance of public safety and the preservation of public order. The framework will support easy entry into the industry of video entertainment sales or rental service providers, reducing regulatory overhead as much as possible in this area of activity which has neither control of supply nor market dominance, considering the multiple channels by which these products can be obtained. In that regard, regulation will be limited to that which is sufficient to ensure compliance with the content management provisions pursuant to (2) above. Advise the Minister on recommended regulatory instruments and orders to support the management of the regulatory framework herein established. The Data Protection Bill 2009 was introduced in the House of Representatives in January 2009 which was identical to the Data Protection Bill 2008 that lapsed in the previous session of Parliament. Following concerns raised by the Opposition, the Bill was referred to a Joint Select Committee in February 2009. The Joint Select Committee Report was laid on May 15 2009. However, the Bill lapsed with the end of the Parliament session in January 8 2010. Parliament website on the Data Protection Bill 2009 which includes the Hansard of the discussions in Parliament on the Bill. The Electronic Transactions Bill 2009 was introduced to the House of Representatives in January 2009. Parliament website on the Electronic Transactions 2009 which includes the Hansard of the discussions in Parliament on the Bill.